Some long-living animals seem to defy the rules of ageing, so scientists are studying them. Two animals of interest to researchers are the naked mole rat, which lives decades longer than its rodent relatives, and turtles, which can live up to 200 years. Researchers have found noticeable differences in the ways these animals’ metabolisms and mitochondria function. Being a freak of nature isn’t always a bad thing, especially if you defy the conventions of ageing. Naked mole rats and turtles are outliers when it comes to the rules of nature. The mole rat lives up to 31 years, decades longer than its other rodent relatives. Turtles are one of the longest-living creatures on Earth. Comparing the biology of these animals to others that age poorly provides valuable insights to scientists about which biological pathways are most important for longevity. That information could ultimately help them find ways to increase human lifespans. A cornucopia of factors are at play as a younger organism gets older: proteins get damaged, they build up and disrupt cell functions, mutations occur, and once-harmless cells turn into cancer. But the important question when it comes to ageing is not how it happens, according to Richard Miller, director of the Glenn Center of Ageing Research at the University of Michigan. “The real question is what has been done across species or within a species to slow it,” Miller told Business Insider. A popular theory in the field of ageing is that an organism puts most of its resources – such as nutrients, energy, time and effort – either into maintaining their body or reproducing, but not both. In people, for example, women’s average lifespan decreases if they have children. Scientists believe this happens because human reproduction can cause damage to cells and deplete resources in the body that would otherwise have been used for cellular repair. But paradoxically, breeding seems to extend the life of the naked mole rat. Scientists Martin Bens and Alessandro Ori at the The Leibniz Institute on Ageing in Germany are working to understand this anomaly. Each colony of mole rats designates a queen, the same way ants do, and only she breeds and bears young. There is also only one breeding male per colony. But non-breeders can transition to become a breeder, so Bens and Ori studied that transition process. Their results suggested that the signal pathways involved in mole rats’ transition to breeding are also involved in their ageing process. In males, some of these overlapping pathways are related to their metabolism, the process of converting food to usable units of energy in the body. Scientists found that breeding male mole rats produced greater-than-normal amounts of energy in their testes cells, and lower-than-normal amounts in their skin cells. Diverting energy in this way could play a role in delaying the ageing process. Ori and Bens also observed differences in the composition of the mole rats’ mitochondria: the small organelles in cells that power metabolic processes. They observed that the naked mole rats had a reduced mitochondria respiration rate compared to guinea pigs, which meant that the mole rats were making less energy and using less fuel and oxygen. The researchers also found that all the naked mole rats preferred to use lipids or fats as an energy source, rather than the carbohydrates or sugars that shorter-lived rodents mostly use. 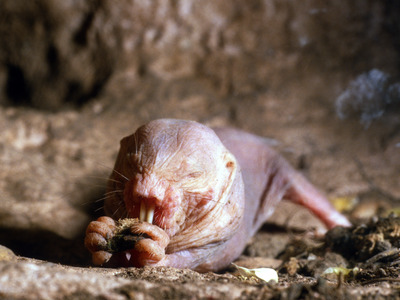 Another factor that allows naked mole rats to live so long is their abnormally low body temperature. Lower basal body temperatures in animals are usually correlated with prolonged healthspan, and naked mole rats are mammals but aren’t warm-blooded, which makes them an anomaly in the rodent family. 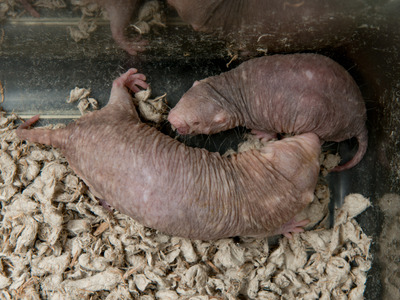 Finally, Ori and Bens examined naked mole rats’ livers. Livers generally detoxify the body and eliminate chemicals that can damage cells and accelerate ageing. In mole rats, these detox pathways were more active than the same systems in guinea pigs, suggesting that mole rats keep their cells healthy and undamaged from toxins more efficiently. That could also explain why they out-live their rodent cousins. Tortoises and turtles are masters of ageing. Jonathan, a Seychelles giant tortoise, is the oldest known terrestrial animal at 186 years of age, and is going strong. “There are tortoises until recently that knew Darwin personally,” Kenneth Storey, a professor at Carleton University who studies turtles, told Business Insider. These ancient beings are the most evolved and complex animal that can survive complete anoxia: a total absence of oxygen. Turtles can go well over a year without oxygen. By comparison, naked mole rats can survive almost 20 minutes without oxygen, and oxygen-deprived humans only get about two minutes of brain activity and five minutes of heart activity before all systems shut down and organs become irreparably damaged. To live without oxygen, Storey said, turtles drop their metabolism rate to next to nothing. “What the turtles do is in a tissue-specific manner, shut down genes and sub-cellular organelles that use energy or that need maintenance,” he said. Turtles shut their energy production off by changing an enzyme called pyruvate dehydrogenase, which turns off their mitochondria.Starving the mitochondria then forces the turtle’s body to secrete a special protein that protects cells. In the absence of oxygen, turtles can initiate an organised shutdown of 50,000 processes in their bodies. “We know what happens to the pathways and we know what happens to the system, but we don’t know what ultimately controls it,” Storey said. In these circumstances, turtles turn off most of their stress-response proteins so they can focus what little energy they have on reshaping their cells to operate differently in anoxic conditions. Those changes include preventing cells from digesting and turning over proteins, a process called autophagy that can make detritus and cause damage. Limiting the amount of matter created and destroyed in their bodies allows turtles to maintain a pristine internal balance. By comparison, human cells that are deprived of oxygen turn on stress kinases: signalling proteins that help facilitate communication in the body in order to respond to a challenging situation. Over-activating stress kinases can use up a lot of energy, overload the system, and ultimately trigger cell death. When juxtaposing humans and turtles, Storey thinks longevity depends on an energy trade-off. The idea that metabolism is one of the key factors in the ageing process has been a cornerstone of many studies on ageing. Hypothetically, if you turned down the energy production in your cells, you could live longer and get fewer wrinkles, Storey said. But you would probably not have enough energy to sustain a normal human life. Humans’ complexities mean we require more energy and a constant supply of oxygen to power our cells. We also need to consume food frequently to fuel our bodily functions. “What we’ve opted for is a high velocity lifestyle, which ties us in to oxygen all the time,” Storey said. Rozalyn Anderson, an associate professor at the University of Wisconsin School of Medicine and Public Health, told Business Insider that it’s hard to ignore how big a role metabolism and energy balance play in ageing. Anderson studies caloric restriction in monkeys, and said evidence is starting to show that age-related diseases show up with increased prevalence in people who have metabolic issues and obesity. “I think it’s all about energy: energy use, energy storage, and the type of pathways that are being engaged to derive energy,” Anderson said.